Quantity Deduction and Automatic "Builds"
In QuickBooks, quantity for the "assembly" is deducted when you create an order (sales receipts, sales order, etc) using the assembly. Quantity for the child items are deducted when you "build" the assembly. This is different behavior compared to Teapplix itself if you use Teapplix InventoryAdvisor, where "build" is not required. 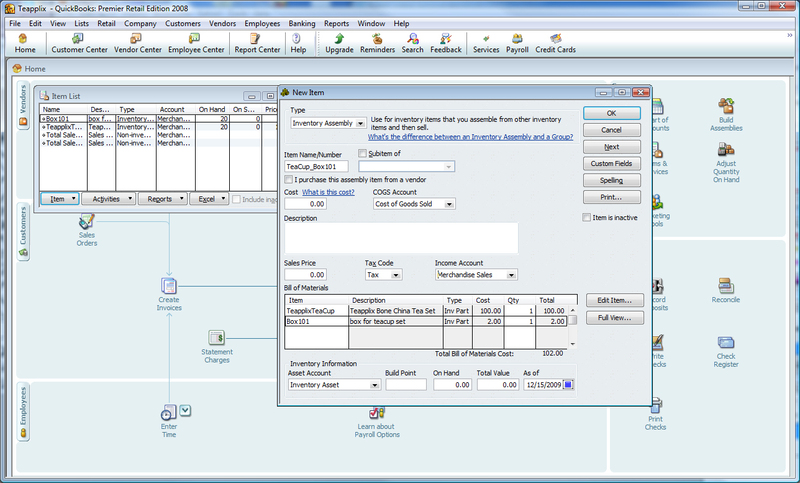 However, Teapplix can automatically perform "build" in your QuickBooks when exporting the orders to QuickBooks. You can turn this on in Teapplix Integration Setup, "automatically build inventory assembly". With Teapplix doing automatic builds of your inventory assembly, we typically do not recommend you do manual builds in QuickBooks, unless it is only to cover orders that you manually type into QuickBooks. Inventory Assemblies in QuickBooks maps to "Combo" products in Teapplix, with inventory_type = 1. You will see this when you turn on MultiChannel Inventory in Teapplix. Inventory Assembly feature is only available in QuickBooks Premier or above. Some people may want to use "Group" to represent a kit. However, this can not be done. The reason, is that in QuickBooks, you can not assign a single price to a "Group". Instead, each line item must have a separate price. When you sell a kit on eBay / Amazon, this is not the case, you have a single kit price presented to the customer. As a result, Teapplix does not allow you to map to Groups.